President Papazian visits the Student Advocates for Higher Education table at the Fall Student Organization Fair (Photo: James Tensuan, ’15 Photojournalism). Each fall our campus brims with a sense of optimism, energy and hope, energized by the presence of thousands of new students—more than 11,000 this year, a record high—and more than 40,000 students, faculty and staff members engaged in myriad activities in classrooms, labs, performance venues, offices, playing fields and recreational spaces. The energy and intensity of activity is a vivid reminder that truly, we are a “city within a city.” This reality was brought home for me while strolling the campus in recent weeks greeting students, faculty and staff members, neighbors, and other visitors. My September blog has updates on various new initiatives, celebrates several points of pride, and highlights important upcoming opportunities to impact and influence the future direction of our university. These are the sorts of updates that would be anticipated at the beginning of the academic year. Yet, as we know, this has begun as anything but a “customary” year. Devastating hurricanes have pummeled Southeastern states and the Caribbean. Deadly terror attacks in Europe rattled nerves worldwide. And partisan divisiveness and political rancor have opened new racial, ethnic and cultural wounds while testing the boundaries of free speech and tearing at the fabric of communities near and far. On our campus, we know that the Trump Administration’s recent decision to end the Deferred Action for Childhood Arrivals (DACA) program has heightened anxiety for our immigrant students and others. Although there are suggestions of a possible compromise that could lead to legislation protecting DACA students, its fate—and the future of these students and employees—remains uncertain. As I observed two weeks ago, my administration stands with the leadership of the California State University (CSU) in its unwavering commitment to our DACA students and employees. We will continue to offer them our support while keeping a close eye on policy developments out of Washington, D.C.
Additionally, we are watchfully observing how neighboring campuses are managing potentially incendiary public events. Let me be clear that it is not my intent to paint a bleak portrait of the year ahead. Far from it; as I observed during last month’s Fall Welcome Address, I am excited about the year ahead and beyond. There is much about which to be optimistic. Based on what I am hearing and seeing, I sense that many of you agree. So, while we should take stock of circumstances around us, I am confident that sticking to our core values—a commitment to the success of our students and our legacy as a community that celebrates equity, diversity and inclusion—will keep us focused and on track. I believe it is important to keep this essential truth in mind, especially as we begin our year-long strategic planning effort and welcome an accreditation team to campus later this month. I’ll share more on these and other campus news items later in this blog. But before turning to those items, I want to acknowledge the important contributions SJSU faculty and staff members and students have made in elevating the public’s understanding of climatic conditions that, in recent weeks, have devastated communities. Last month, efforts by SJSU’s Fire Weather Research Laboratory to better understanding the behavior of natural wildfires were the subject of a major story in the Mercury News. The story explored efforts by Professor Craig Clements, faculty colleagues and graduate students to uncover clues they believe can predict the potential spread of future wildfires and save lives. At the heart of their work is an innovative application of traditional Doppler technology. As the Mercury News reported, “Craig is doing something that’s a little different,” said Chris Waters, a battalion chief with the California Department of Forestry and Fire Protection, or Cal Fire. Meanwhile, climate scientist Professor Alison Bridger has been providing periodic commentary on severe weather as a contributor to Fortune.com. Her latest installment, published online last Friday, was an update on Hurricane Irma in the wake of its destructive course through the Caribbean and Florida. Professors Clements and Bridger are well-established experts in their respective disciplines, and they are joined by many of their campus colleagues in sharing their expertise while elevating SJSU’s national profile. I want to thank all of our subject-matter experts for contributing their time and expertise to this important public service. At my investiture last spring and during last month’s Fall Welcome Address, I stressed the importance of openness to embracing change if we are fully to leverage opportunities to serve students and our region as Silicon Valley’s public university. Thursday’s official launch of our strategic planning initiative started this journey. It is clearer than ever to me that this university is capable of wonderful things. And I am confident that the work we collectively will do through next fall—strategic dreaming, as I’ve characterized it—will point us in the right direction. We have structured the process—dialogue and study this semester; a solid draft plan developed by next spring and ready for review in May; further review and formal adoption by next December—to ensure ample time for inclusive input. During the week of Sept. 18, you will be able to attend one of many guided in-person and online conversations for various campus stakeholders. Searches for two key academic leadership positions—deans of the College of Humanities and the Arts and the Lurie College of Education—are underway. A third, seeking candidates to lead our College of Science as it matures plans for a science and innovation complex, will be underway very soon. We also will be preparing to launch a national search for a vice president for Student Affairs. Updates on all searches will be published throughout the fall, and I will share key developments in future blog posts. Over the last several years, our campus community engaged in discussions, data gathering and self-reflection in preparation for a routine accreditation review by the Western Senior College and University Commission (WSCUC). A Special Visit by the accreditation team is scheduled Sept. 26 and 27 to follow up on developments in the areas of leadership, organizational climate, shared governance, and campus climate. Two open forums—one for students and another for faculty and staff members—have been scheduled for Sept. 27. Details on these forums and other background has been published online. I am grateful for the considerable work that has gone into our accreditation review and preparations for this follow up visit. I particularly want to thank Kathleen McConnell, associate professor of rhetorical studies, who took on this important work when Professor Cami Johnson transitioned into the provost’s office and has seamlessly moved it forward. An important note: Our accreditors understand that not everyone who may wish to participate can attend these meetings, and therefore they have established a confidential email account to give everyone the opportunity to communicate with the team. To write to the team, please address your email to sjsu@wscuc.org. This email account was created by a WSCUC staff member and only authorized WSCUC staff and team members have access to it. The emails will not be viewed by any representative of SJSU. An eclectic mix of informative, engaging campus and social programming has been created for our second annual SJSU’s Parent and Family Weekend, Thur.-Sun., Sept. 21-24. This year’s program includes a Friday evening reception, Saturday breakfast and conversation with members of the SJSU administration, pre-game tailgate at CEFCU Stadium and tickets to SJSU’s Mountain West Conference opening game against Utah State. Optional programming includes San Jose Sharks and San Francisco 49ers home contests, both on Thursday. Meaningfully engaging parents and families of students is an easily-overlooked, yet important contributor to student success. When families are connected to and proud of their student’s choice of school, that pride extends to students and those around them. And, parent and family engagement fosters relationships that can deepen long after graduation. If you are a parent or family member of a current student, please take part! And please pass along this information to others. As we seek strategically to engage students’ families, we also continue to build bridges with partners that share our commitment to this region’s future. Earlier this month we hosted the Knight Foundation’s national board of directors and staff for a lunch meeting in the Dr. Martin Luther King Jr. Library. Knight’s representatives were in San Jose for a two-day site visit to explore ways to help vitalize our city; our library—a great example of civic/university collaboration—was the perfect venue. Knight’s local program manager Danny Harris was instrumental to bringing our institutions together; I am grateful for his commitment and efforts. Wednesday evening, in partnership with the Silicon Valley Leadership Group, we hosted a dinner for a small group of Silicon Valley CEOs at the president’s residence. This was an important opportunity to serve as a convener of meaningful dialogue among key regional leaders. I also want to take this opportunity to acknowledge and congratulate Muhammed Chaudhry ’04 Finance as he transitions away from the Silicon Valley Education Foundation (SVEF) after serving for 16 years as its founding CEO. A proud Spartan, his story is San Jose State’s story. Chaudhry transformed SVEF from a fledgling non-profit into a thriving, dynamic enterprise supporting college access for K-12 students from underserved areas. Under his leadership, the foundation became especially known for innovative approaches to STEM education, especially math readiness. The Spartan East Side Promise is another byproduct of Chaudhry’s efforts. And, well beyond education reform, he has emerged as a leading national voice on issues affecting American Muslims. I join other Silicon Valley leaders and the SJSU community in wishing Muhammed Chaudhry all the best as he moves forward. Health and wellness are top-of-mind issues for our campus. We were an early adopter of tobacco-free policies; we have taken meaningful steps toward becoming bike-friendly; we boast a state-of-the-art Student Health Center. SJSU has taken another step, joining Healthy Campus 2020, a growing cohort of colleges and universities nationally in a movement aimed at supporting better health among students, faculty and staff members. The national affiliation provides to us a broad strategy and practical framework for developing wellness programs uniquely suited to our community’s interests and needs. Locally, our steering committee has adopted SJSU—Treat Yourself Well! as its launch theme. This fall, the campaign was softly launched during Weeks of Welcome with booth presence and flyers promoting “10 Ways to Treat Yourself Well.” Healthy campus information also is available on the SJSU Sammy mobile app for Android or Apple devices. A website is in the process of being developed. The steering committee eventually hopes to create a searchable inventory of existing and planned health-related resources, programs and initiatives. There also are plans to incorporate Healthy Campus 2020 into appropriate curriculum. Commitments already have been secured from faculty teaching two health-related courses (HS 1 and HS 104); the Center for Faculty Development is planning lunch and learn sessions; and health-related messaging is planned for faculty communications this year. Much appreciation is owed to our steering committee and its co-chairs Kathleen Roe, chair of the Department of Health Science and Recreation; Romando Nash, associate vice president for Student Services; and Christine Wong Mineta, assistant director, Wellness and Health Promotion. 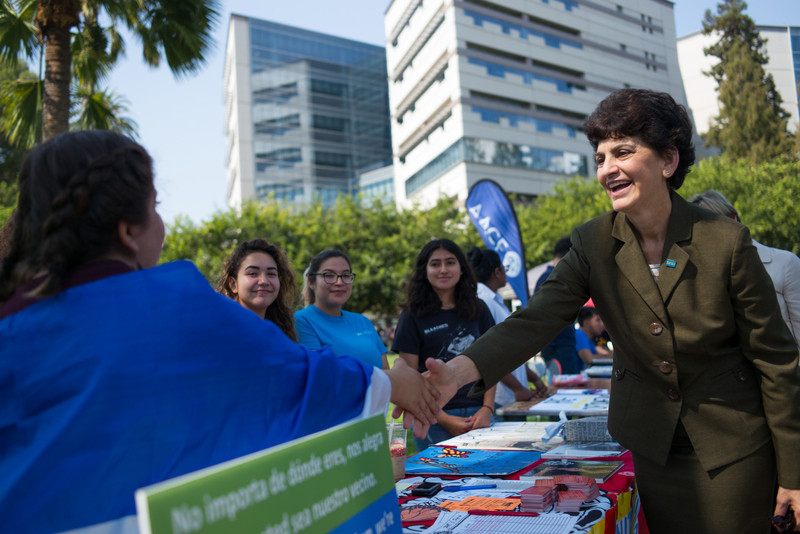 In addition to abiding commitments to personal health and wellness, SJSU has actively promoted community health and global sustainability through meaningful creative activities and productive community partnerships. This work—performed by our faculty and staff members and students with supreme dedication and little fanfare—was rewarded last month when the Sierra Club’s annual “Cool School” rankings placed SJSU among the nation’s 50 most sustainable colleges and universities and first among 23 CSU campuses. This top-50 national ranking was buttressed by successes in sustainability outreach and events; waste management; and innovation. Programs like the Spartan Superway Solar-Powered Automated Transit Network, Green Ninja, and CommUniverCity’s efforts to combat illegal dumping in partnership with the City of San Jose have established SJSU as a model for sustainability leadership among higher education institutions. I would like to take a moment to thank all who have made this recognition possible—students engaged in community activism; faculty engaged in creative classroom and field activities; and our committed staff members in facilities development and operations. All share in this hard-earned, well-deserved recognition. In U.S. News’ just-released 2017 rankings of colleges and universities, SJSU maintains its strong #6 ranking among regional public comprehensive universities. More notably, we for the first time appear among the nation’s top veterans-serving academic institutions, ranking 20th overall and fourth among public universities. Helping veterans transition from military service into academic and career opportunities long has been a campus priority and point of pride; our latest U.S. News ranking affirms this. Congratulations to all those in our community who support this important work and helped garner this national recognition. With fall Spartan athletics squads in action all over the country, a few recent highlights deserve special mention. Our volleyball team has opened 8-3, with a signature victory over Pepperdine and winning the Drake Invitational in Des Moines, Iowa. They defeated local rival Santa Clara Saturday for the first time since 2001, and open conference play at Nevada Tuesday. Women’s cross country last weekend dominated the Fresno Invitational, sweeping all three podium spots and winning the team competition. It often is said that intercollegiate athletics is about character as much as it is about wins and losses. Sometimes, that sounds very cliché; on other occasions, it rings very true. At the SJSU/Texas football game in Austin earlier this month, Head Coach Brent Brennan and his entire staff wore “Houston Strong” t-shirts in in the wake of Hurricane Harvey. I hope that the coming weeks of fall bring our community inspiration and hope.